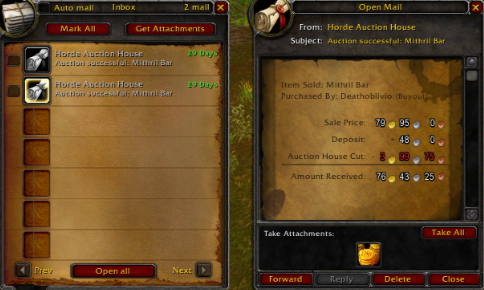 The prices for mithril bars are crazy on my server at the moment as you can see in the screenshot below. It seems that this metal has replaced thorium as the expensive old world material on my auction house and I am more than happy to sell it for these kinds of prices. Are mithril prices similar on your server? Why do you think it has overtaken thorium? When should I start my career as a professional artist? Am I a cool cat in real life? Sorry for the randomness, I promise a more useful post tomorrow! I thought it might be useful to show this just in case any of you find this quest to be bugged in the near future. 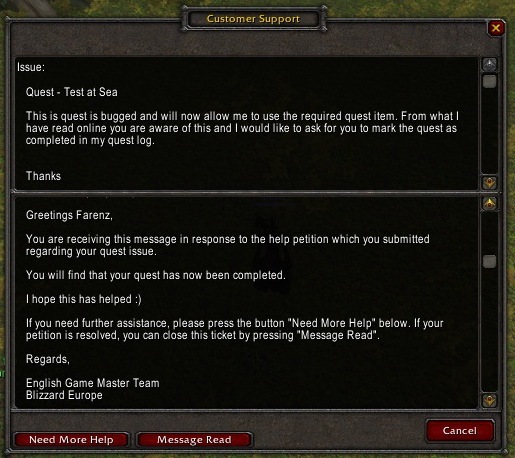 Make sure to ask politely for the GM to complete the quest in your log and you will not miss out on the XP or the Loremaster Achievement you are after. Finally we arrive in Northrend! Outland passed me by so quickly I don’t really know what to say. By this time I was expecting to be able to moan about how much I hated the experience but it was great. The combination of having a flying mount and very little downtime meant that I sped through each zone and raked in the XP. I had memories of Outland being this horrible grind to level 68 so I could quickly escape to WOTLK content but it was quite the opposite. 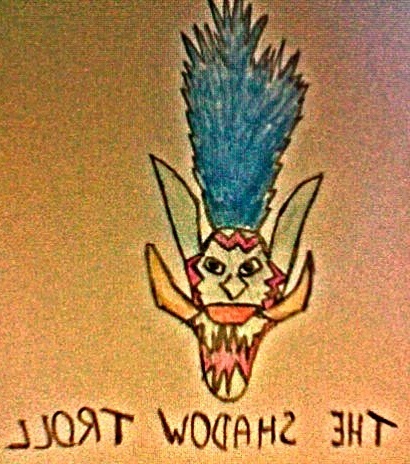 "Throm-Ka, Troll! 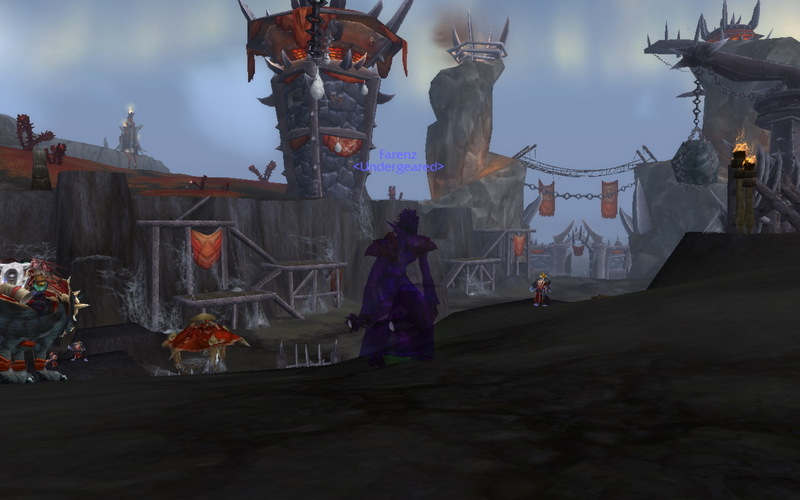 Welcome to Warsong Hold. My heart swells with pride to see that such a distinguished hero of the Horde has answered the call of duty!" I’ve always enjoyed the WOTLK quests and I look forward to starting them after I finish this post. I now need to start looking out for gear that might actually come in useful during the Undergered project. 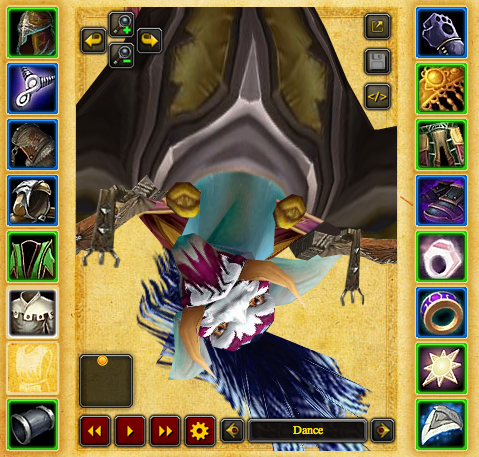 This means I need to pick which reputations to improve, which zones to visit and which dungeons to enter. Forum Post Friday – New Armory = No Privacy? Each Friday I will pick a forum post from the World of Warcraft EU forums and discuss it. I will pick the post from anywhere within these forums depending on what I find interesting, funny or just rather annoying. Please click here for today’s forum post! This post is started by a player that believes that the new Armory feature that shows your character’s activity has serious privacy implications and there should be an option to disable this from being displayed to the public. Although this post quickly turns into a flame war I think it is an interesting topic and it certainly has some people worried. I personally think that a small but vocal minority are overreacting to the situation and are either embarrassed of how much time they spend playing WoW or trying to hide something from people they know. I love the new armory and think Blizzard have made some great changes to its functionality and it makes me want to use the armory more often. However I think it would be an idea to include an option to disable the activity feature just to appease the players that find it such a breach of privacy and I’m sure it can be done very easily. And guys, if you are really that concerned about the armory and its lacks of privacy just don’t give away the name of your character to people that you know. “I don’t like that people (friends, parents, my son, my wife, mu husband, my sister, my boss, my roommate, my colleague, my guildmante, my guild officer, etc) can just peek at my page to see when I play and how much I play. I just ask the option to disable it. Would you like to use Messenger or any other IM tool without such an option (“invisible mode”)? Would you like if your email messages were able to auto-respond to the sender “email read!” without your permission? the internet offers you anonymity. you don’t need “privacy” because no1 knows who you are. sersiously. What are your thoughts on the new Armory design? Is it a breach of privacy? Should there be an on/off switch? Why do I always pick the good guys? When entering Shattrath you have the opportunity to start the quest A’dal which eventually leads to yourself deciding if you want to be a part of the Aldor or the Scryers. I’ve just completed that seres of quests and decided to help the proud Aldor, the defenders of the Light! Neither faction really offers me any reason to pick them in terms of gear or useful items, I’m level 67 and will soon be leaving behind this alien world. However I realized I couldn’t pick the Scryers, I just couldn’t do it. They are not an ‘evil’ faction but they are obviously not the ‘good guys’ and I would feel incredibly guilty if I decided to pick them. Looking back at my past characters I realized that I had only ever picked the Scryers once and that was because I had decided that I really needed that particular shoulder enchant for what I intended to do. So maybe I just have a slight phobia of Blood Elf males (who doesn’t?) but this trend does not stop with Shattrath. I remember with one character I actually managed to get the Green Proto Drake from the Oracles and then realized I no longer needed anything from this faction. After much consideration I decided to reset my reputation with the Oracles and join the Wolvar to see if there was anything I may find useful and pick up a couple of achievements. That lasted about two days before I went crawling back to the Oracles and begged for forgiveness. I was now beginning to realize that I had a problem. Looking at other games where I had to decide between ‘good’ and ‘evil’ I came to the conclusion that I was indeed a goodie two shoes. I have played games such as Oblivion, Neverwinter Nights, Black and White or even Mass Effect and never even considered stepping outside of my comfort zone. I’m such a failure! Do any of you guys have the same issue? Why do you always pick the ‘good’ or ‘bad’ guys? Am I turning into a Roleplayer? I have just made the transition from my old blog to this new and hopefully better location. I decided to move my blog because I felt that the previous name did not really fit my blog and hopefully The Shadow Troll will suit me a little better. I have also changed from using blogspot.com to wordpress and I definitely prefer this setup. It feels a lot more up to date and although I’m very new to blogging I have a whole lot of features to keep me entertained. Transferring all the posts I have written so far was far easier than I thought it would be but I imagine there might be a few mistakes here and there. I will try my best to modify these but please let me know if you notice anything amiss in my previous posts. Well this was just a quick post to explain my decision and hopefully you enjoy the new blog!